Size of Male: 55 lbs., 23 in. Size of Female: 55 lbs., Less than 23 in. The Airedale Terrier is a picture of youthfulness and the king of terriers. You will see the same bouncy, rambunctious behavior from puppyhood to adulthood. The dogs are always up for some roughing up and will pounce upon small prey as if the experience is a first! 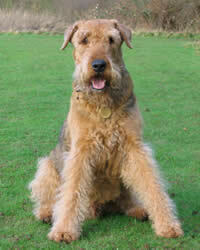 For an energetic pet that doubles as an effective badger, the Airedale Terrier comes along as an easy choice. The king of terriers hails from an English valley called Aire and many of the dogs then frequented the nearby Aire River during the mid-19th century. As you may well guess, the dogs swam with otterhounds and were quite adept in crossing the waters and hunting for small game. The dogs were later interbred with Bull Terriers and Irish Terriers to produce offspring that would do well in the show ring. Though the Airdale Terrier is not the most handsome of canines, it is one of the most versatile and energetic. There are specific occasions when the dog exhibits a temperament that is unique to a particular group or event. You may find the Airedale Terrier lovable and entertaining during exclusive family bonding moments. Yet, for all their sweetness, they have designs to become the boss. These dogs may be reserved and polite to a guest or stranger. However, they may also be quick to flaunt their spunky and courageous selves among other dogs. It’s not uncommon for the breed to prey upon smaller animals, so you may want to think twice about having this dog breed as a pet if your home harbors other furry creatures. Living Environment – The Airdale Terrier does best in a home with a mid-sized yard, where the dogs can channel their high energy levels. The breed isn’t tailored to live comfortably in even the best apartment. This dog breed has a tendency to become destructive if you don’t lavish the pooch with companionship and enough exercise. Grooming – What’s nice about the Airedale is that they are not heavy shedders. Still, you must care for their coat. Trimming every 2 months and combing every 3 days are essential to prevent matting. Show dogs may need to be hand-stripped instead of clipped. Baths are given only when necessary. Diet & Exercise – The nutritional requirements of this king of terriers are geared towards muscle development. According to experts, the protein source must be easily digestible. Lamb, organic meat and rice are the preferred combination, with vegetables and cheese to match. You may feed pups 3 to 4 times a day, but once the breed reaches adulthood, remember to limit the feedings to 2 square meals or 1 giant serving only in a day. As can be expected from large canines, the Airdale is prone to developing orthopedic problems. Take care not to overexhaust the rambunctious breed. Long daily walks or supervised off-leash play in a yard will suffice. The best treat for this water-loving dog is a day out swimming. Health – Airdale Terriers are not different from other huge dogs. Obesity often invites hip dysplasia ? a loosening of the ball and socket which makes sitting or standing painful for the dog. There are also a number of issues that may or may not plague your pooch: allergies, gastric torsion, chronic heart disease, bleeding disorders and thyroid complications. The novice pet owner will usually find the Airdale Terrier too much to handle. In fact, only the expert and firm owner can truly temper the obstinate and energetic breed. You?ve got to use the right training style. With consistent, firm and gentle handling, Airdales turn out to be quick learners and agreeable trainees.